I don’t play the lottery, but I must admit I do get caught up in all the hoopla when the jackpot reaches a record high. The thrill of winning half a billion dollars had me stopping off at the C-Store to purchase a few tickets. It’s funny how I don’t think about the lottery until I actually have a ticket in hand and then, the daydreaming begins. I don’t say prayers filled with promises I’m not sure I’d keep, like donating half to a charity or keeping my day job (If I had one). Truth is: I would spend a lot of money! Not just on myself, but on my family and a few close friends. While skyping with my son in Japan this morning, my daydreaming became contagious, and my son had a few ideas of his own. My plans of traveling the world and building a giant compound to house said family–as well as traveling the world over—were trumped by the promise I made to my son. Yes, I made a promise. After all, I want to win! Though he liked the idea of a huge mansion complete with a movie theatre, bowling alley, infinite pool, and an intercom system that I could use to call the family to order, he wanted a place of his own. So, if you hear about a family from Tennessee building a giant spaceship (just like the one in the series Firefly) next to a giant mansion in which their son CAPTAIN BEN will reside, you will know: I won the lottery… and kept my promise. Good luck to all those daydreamers out there! It’s that time of year again. Time to get up early, take on a few turkeys, and spend countless hours preparing for that big moment. Friends and family will gather, and though there is much to be thankful for, the occasion will be bittersweet. It is the end of an era, the end of a tradition, and yes; it is the end of the Twilight Saga’s midnight premiere! It all started July 7, 2008—over four years ago. My daughter was eleven and had been anxiously waiting for the release of the final book, Breaking Dawn. I had not yet read the books and wasn’t sure what all the hysteria was about, but being the “supportive” Mom that I am, I escorted my daughter to our local Borders book store for a midnight release. Barely able to stay awake and totally confused by the Team Edward/Team Jacob debate, I watched my daughter as she answered trivia questions with delight. It was four months before I read the books for myself. I have always been a fan of vampires, and Buffy the Vampire Slayer was my all-time fave. I didn’t watch it when it was a popular TV series, (I was a late bloomer) I purchased the seasons on DVD. Years later, I introduced my daughter to the sometimes corny but always entertaining Buffy. We spent an entire summer watching every episode. I knew our bond was special when I discovered she secretly rooted for a Spike and Buffy love affair. And who can resist the love triangle between Stephan, Damon, and Elena on Vampire Diaries? When the Twilight movies hit the big screen, it became an annual event of sitting in long lines, playing games, and standing up to all those die-hard-twi-hard fans that were certain we were there to steal their seats. This year, things were different. It began in the morning with a short stint in line for an 11:20 showing of the first movie, Twilight. With thirty minutes between shows, we sat through four movies before the big finale, which didn’t disappoint! I won’t lie; I dozed off a few times. (Am I the only one that thinks Jacob is a big whiner?) But the big moment came halfway through Breaking Dawn Part One. Since having my sinus surgery in October, my head has never been clearer. So now that I can breathe freely, I have discovered allergies. Yes, I am sneezing twenty times a day. In a quiet and very dramatic scene, I sneezed five times. But it didn’t stop there. I felt the tickle of a lingering sneeze and fought to hold it in. Impossible. It came out in a high-pitched ACHOO!! My girlfriends giggled, and snickers could be heard around the theatre. Then, the room fell silent again–you could have heard a pin drop. That’s when I went into a giggle fit that I couldn’t control. It was contagious. The more I laughed, the more my girlfriends laughed. I was a slobbering, snorting, tearing mess as I held my hand over my mouth and made a quick escape to the lobby. This is a tick that has haunted me since I was a young girl. I once laughed myself to the principal’s office when a giggle fit started in class during testing. I was terrified to be in trouble, but for some reason, I couldn’t stop–even as I sat in front of the principal, who by now was questioning my sanity. To this day, I don’t know what was so funny. It’s not always easy to laugh, trust me; I know. So here are a few tips for this holiday season. SMILE: It’s where laughter begins and is highly contagious! SURROUND YOURSELF WITH POSITIVE PEOPLE: People who laugh at life’s absurdities can find humor in ordinary events. KEEP A HEALTHY PERSPECTIVE: Remember, many things in life are beyond your control. LAUGH AT YOURSELF: I do this frequently. The best way is to talk about the times you took yourself too seriously. COUNT YOUR BLESSINGS: Consider the good things in your life and be thankful. A state of sadness means you have less room for humor and laughter. 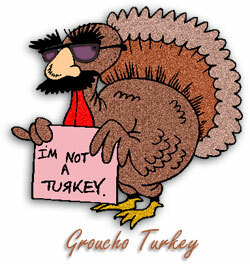 DON’T BE A TURKEY: Be the positive in someone else’s life and it will make a difference in yours. Spread the love, share a smile, and have a Happy Thanksgiving!